Collectors sometimes use unorthodox methods for storing their specimens before they get to the Illinois Natural History Survey’s arthropod collections. All the tarantulas shown here once shared a single pickle jar. They were meticulously separated and relabeled, and now are in proper storage. 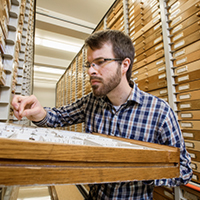 Insect Collections Manager Tommy McElrath looks at pinned specimens in one drawer of the vast INHS collection. CHAMPAIGN, Ill. — Storing your dead tarantulas in a gallon-sized pickle jar is not the best solution to long-term preservation. Especially when those tarantulas are toe-tagged – like corpses in a morgue. But that’s what I find this morning when I open one of the dozens of metal storage cabinets in the chilly insect collection: a pickle jar full of tarantulas. We keep the insect collections cold, around 60-65 F. This slows the evaporation of ethanol used in wet collections and keeps pest populations down. The jar is heavy in my hands, full of yellow-brown dirty alcohol (or potentially other, more harsh chemicals), with dozens and dozens of plum-sized brown tarantulas. Each of hundreds of drawers in the collection contains mounted and labeled specimens. 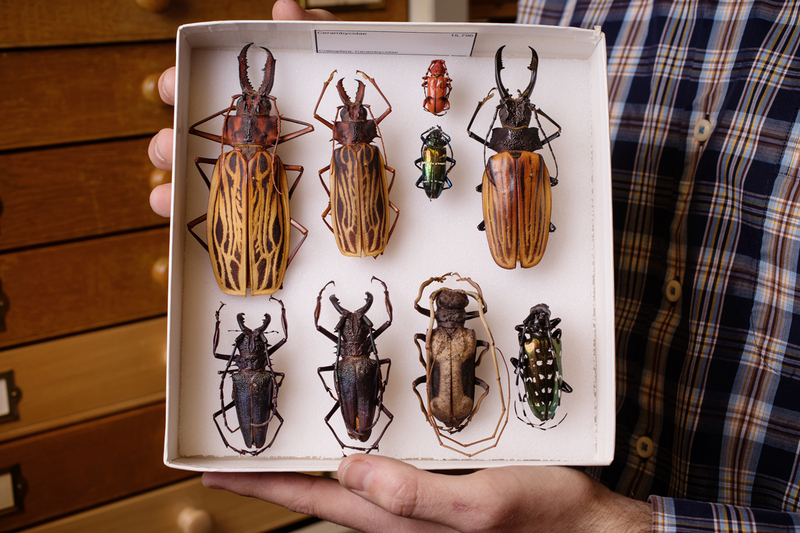 The collection is kept cold and each drawer is sealed to keep living insects from gnawing on the specimens, such as these beautiful longhorn beetles. 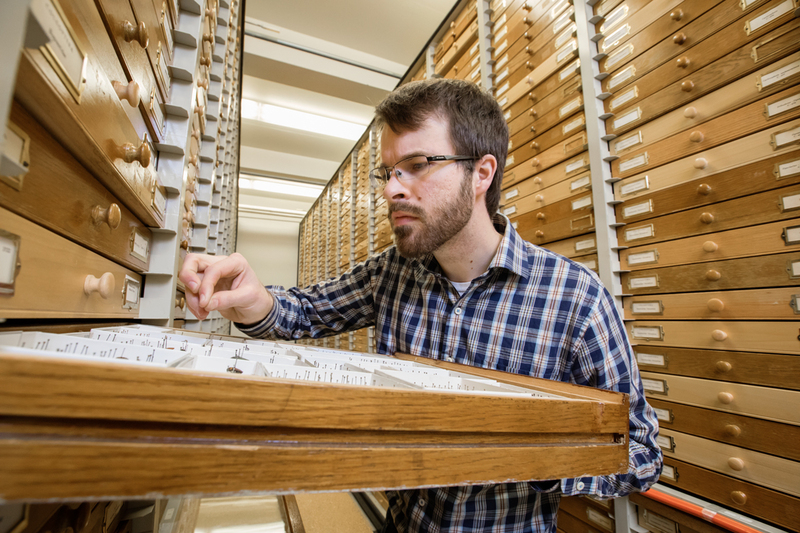 The Illinois Natural History Survey has a large collection of spiders, with nearly 90,000 vials and at least 100,000 specimens at last count. That number has grown much larger recently, with the acquisition of Joseph A. Beatty’s spider collection from Southern Illinois University. 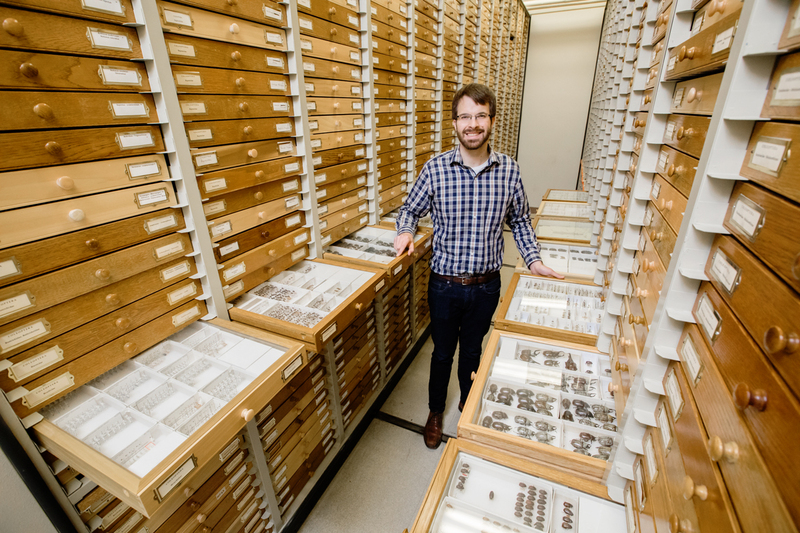 Currently, thanks to a National Science Foundation-funded Collections in Support of Biological Research grant, INHS is digitizing the labels and photographing every single spider in the collection. But this jar wasn't with the other spiders. 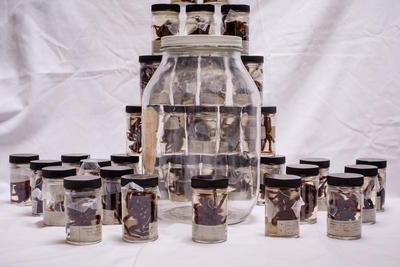 Beatty collected the tarantulas in this jar in the 1970s during a trip to Arizona. Perhaps to save space on a long collecting trip, he decided to toe-tag each tarantula with a collecting label, rather than put each spider and label in a separate jar. This was an ingenious short-term solution, to be sure, but not a permanent one. As I hold the jar, noticing the different toe tags neatly tied to each spider leg, I know I need to get these moved to new, separate jars immediately. Spider legs can detach easily when moved, and to maintain the spiders with their labels, they must be stored individually. I walk over to our work area just past the green metal ethanol storage cabinets and set down the jar in front of one of our summer volunteers. My volunteer, an undergraduate student with a passion for entomology, is happy to do so. Each tarantula will get its own specimen label, be photographed and go back into storage into an appropriately sized jar. Each specimen will be added to our online database for scientists and the public to use. McElrath stands in one of many aisles of the insect collection at the Illinois Natural History Survey. The collection spans eight rooms and includes more than 7.2 million insects and other arthropods. The Illinois Natural History Survey is a division of the Prairie Research Institute at the U. of I.